These two seasoned vets of both absurdist comedy and drama are in fact the only two actors who could have made sense of the skilled but simple assassins at the center of this unconventional Western. By the end, it’s obvious that these two seasoned vets of both absurdist comedy and drama are in fact the only two actors who could have made sense of the skilled but simple assassins, Charlie (Phoenix) and Eli Sisters (Reilly) at the center of this unconventional Western. Based on a novel by Patrick deWitt, “The Sisters Brothers” ambitiously mixes humor, drama, action and art house serenity into a vexing but strangely compelling whole that keeps you guessing till the end. Set in 1851, at the height of the gold rush, these two middle-aged siblings are a team, born of violence into a violent world. Eli and Charlie are not sophisticated, but they are very good at what they do — killing people before they kill them. As Eli explains at one point, once you kill one man, they’ve got a father, friends, cohorts and any number of people who will then try to hunt you down. And the cycle of killings continue. They work for a shadowy figure they call the Commodore who gives them jobs and they take care of it. You get the sense this time that it’s a little more complicated than usual, though, as the Commodore has enlisted a scout, John Morris (played by Jake Gyllenhaal who has the interesting distinction of being the only one in the cast attempting to affect a period appropriate accent) to track down a chemist Hermann Kermit Warm (a very empathetic Riz Ahmed) who will then be turned over to the Sisters brothers to ostensibly torture. Warm has discovered a chemical formula that makes finding gold easier, which he is a little too loose-lipped about and thus has found himself the target of some dangerous men who would like to steal his idea. But the story doesn’t quite go as expected, and tenuous friendships and bonds are formed between the men. It makes for some interesting conversations, moments and a truly horrifying climax. 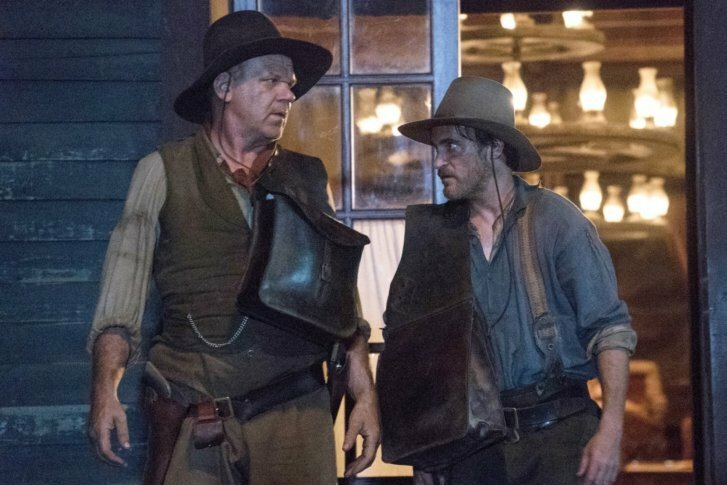 The most surprising thing about “The Sisters Brothers” is the humor. There is a running joke where Charlie comes to hate Morris because of the pretentious words he uses in his letters (Phoenix is so good at nailing befuddled rage), and a visual gag with Eli and a toothbrush, which he’s just discovered. You might be surprised by how much you end up caring about Eli and Charlie over the course of this journey, and, again, it’s all because of Phoenix and Reilly who excellently manage all the various tones in the film. And of course, as expected in any Western, the landscapes and set design are all beautiful and transportive. “The Sisters Brothers” takes a bit of getting used to at the start, but the rewards are worth it. “The Sisters Brothers,” an Annapurna Pictures release, is rated R by the Motion Picture Association of America for “violence including disturbing images, language, and some sexual content.” Running time: 121 minutes. Three stars out of four.